Reuters: Thai political parties on Friday held their largest rallies yet, two days ahead of the country’s first election since a military coup nearly five years ago, but one that critics say will deny power to the most popular party. 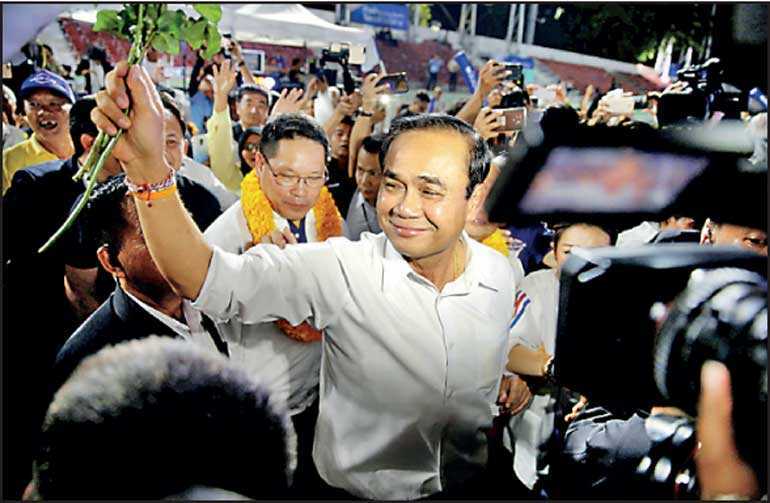 Making his first appearance at an official campaign event, Prime Minister and junta leader Prayuth Chan-o-cha was greeted with his nickname of ‘Uncle Tu’ by supporters of a pro-army party that has nominated him as its prime ministerial candidate. Thailand’s largest party, Pheu Thai, is leading the charge for a ‘democratic front’ of parties against Palang Pracharat, a new military proxy party backing Prayuth. Thaksin, who has been in self-exile since a 2008 corruption conviction, attended his youngest daughter’s wedding in Hong Kong on Friday. In a video clip put online by Thai media outlet Khaosod English, he urged Thai guests to vote. But that may not matter, because the new constitution written by the junta allows Parliament’s upper house, the 250-seat Senate, to vote with the lower house to choose the Prime Minister, and the Senate is entirely appointed by the junta.